My sister is my best friend. She's pretty awesome, I'm not gonna lie. The trouble is, we're in a distance-relationship. Laura (my sister) lives in the Melbourne 'burbs, studying hard at university and working crazy hours to make it all possible. And me? I'm still a country girl, working full time sharing my nutrition knowledge with the good folk of the Latrobe Valley. Two and a bit hours away from my bestie. I don't like to think of Laura being all alone, so far from home. I send letters and the odd parcel her way so she can get a friendly surprise when she (eventually) checks her mailbox. Recently, I sent a little parcel containing odds and sods which had made me think of her. A bag of Apricot Delight was one of them. It reminded me of our childhood and rare occasions when we were allowed to choose treats from the lolly shop to gobble down while watching a movie. Apricot Delight would feature more often than not. 1. 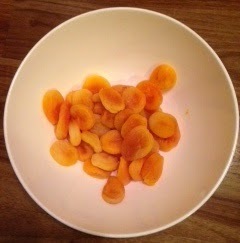 Place the apricots in a large bowl and cover with boiling water to soften. (I left mine for ~3 hours whilst I went out a did stuff. Stuff like booking a trip away with my wonderful sister. And heading to the shops to buy coconut oil. And visiting Nana especially so I could borrow her food processor for step 2. You know, important stuff). 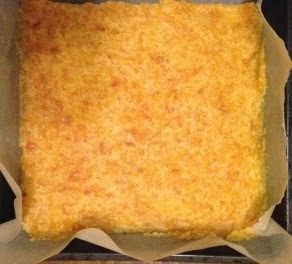 The apricots looking nice and soft and plump after a long soaking. 2. 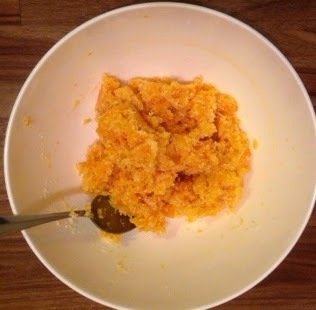 When the apricots are softened, drain and blend in a food processor until they are finely chopped. 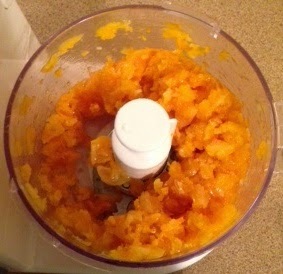 Apricots all blitzed up courtesy of Nana's food processor. I know what I want for Christmas! 3. 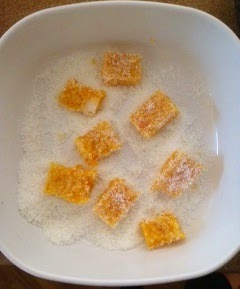 Transfer chopped apricots back into the large bowl and add the dessicated coconut and coconut oil. Mix well. 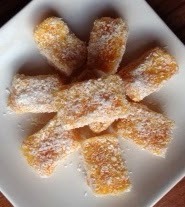 Triple treat: apricots, coconut and coconut oil. 4. Transfer mixture into a baking tray lined with baking paper and spread out at about 2cm thickness. 5. Cover tray with plastic wrap and leave in the fridge overnight. 6. 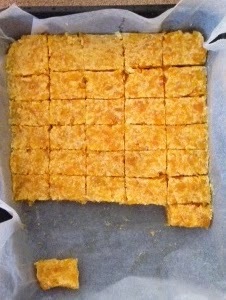 Slice mixture into small rectangles (about 1x2cm), roll in extra coconut. Nutrition Information: Per serve (30g or 3 pieces): Energy 407kj, Protein 1.1g, Total fat 5.8g, Saturated fat 5.3g, Carbohydrates 9.5g, Sugars 8.6g, Dietary fibre 2.5g, Sodium 8.5mg. I hope you enjoy this all natural, preservative-free version of this old classic. Please let me know below if this recipe is a hit with you!